Thomas Watson squeezes the orange and yields more heavenly juice from three verses than many a modern preacher. From Malachi 3:16-18 he writes 168 pages and 16 sermons. This small book would make an excellent Homiletics textbook. A young preacher wonders how he could get forty-five minutes of sermon material from, say, the story of the prodigal son. Here, in an obscure passage, Watson goes phrase by phrase and mines truckloads of truth. The word “then” receives one sermon. “Fear of the Lord” gets five. His lists are endless: four things to consider, nineteen ways it is important to fear God, and two cautions about deceit. I can imagine a homiletical exercise that asks for a sermon manuscript on Malachi 3:16. When the students return frazzled and empty of sufficient material, tell them to read Watson’s ten sermons on the same verse. It may be to them as scales falling from their eyes. The Puritans teach us how to use word pictures in illustrating truth. Like an Eskimo his clothing, Watson layers his metaphors. “Profession is often made a cloak to cover sin” is followed by, “the snow covers many a dunghill”, which is followed by Absalom covering his treason with a religious vow (2Sm. 15). “The fear of God swallows up all other fears, as Moses’ rod swallowed up the magicians rods” (33). How to illustrate the need to share the sweetness of what you have read this week? “Samson having found honey did not only eat of it himself, but carried it to his father and mother” (68). Christian unity: “one single coal is apt to die, but many coals put together keep in the heat” (72). The Great Gain is an excellent counseling manual as well, for it shows how to present Scripture winsomely to the hurting soul. Fear is as lead to the net, to keep a Christian from floating in presumption, and faith is as cork to the net, to keep him form sinking in despair. (15). 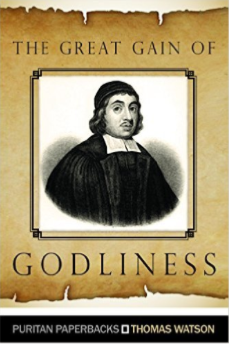 This entry was posted in Book Reviews and tagged 2015 Review, Christian Living, Puritans by Paul Schlehlein. Bookmark the permalink.